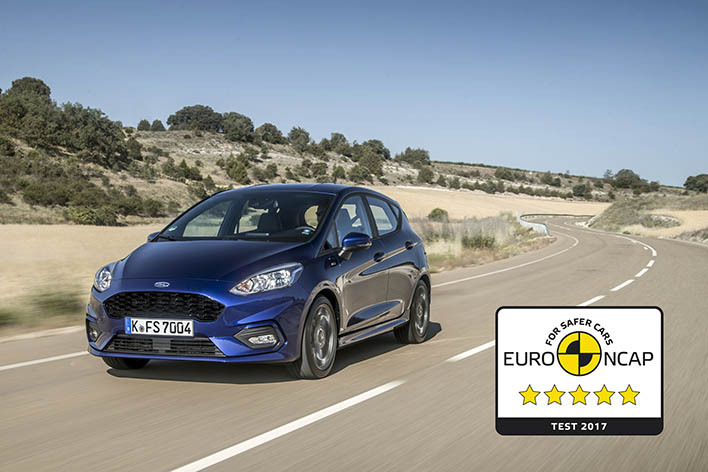 The all-new Ford Fiesta has been awarded the maximum 5-star safety rating by independent crash test authority Euro NCAP. Fiesta – the most technologically-advanced small car on sale in Europe – delivers sophisticated features designed to help prevent or mitigate the impact of an accident for occupants and pedestrians, including an enhanced version of Ford’s Pre-Collision Assist with Pedestrian Detection that for the first time can help prevent collisions in the dark. Euro NCAP awarded high scores to Fiesta for both adult (87 per cent) and child (84 per cent) occupant protection. Fiesta achieved a maximum score in tests designed to replicate a car-to-car side impact, and also scored highly in frontal and side-pole tests – offering a high level of protection for all occupants and good whiplash performance. Driver assistance technologies including Adjustable Speed Limiter and Lane Keeping Aid were highlighted and positively commended by Euro NCAP; as were seatbelt pre-tensioners and load limiters – offered for the first time for rear-seat in addition to front-seat occupants; and front-seat airbag coverage for side head, chest and pelvis. The all-new Fiesta body features 36 per cent more boron steel for greater strength in key areas, including the upper section of the central side-pillar, which uses a new T-section configuration to more effectively transfer side impact energy into the roof. Further advanced driver assistance technologies – supported by two cameras, three radars and 12 ultrasonic sensors, which in combination monitor 360 degrees around the vehicle and scan the road ahead up to a distance of 130 metres – include Active Park Assist with Perpendicular Parking, Adaptive Cruise Control, Auto High Beam, Blind Spot Information System, Cross Traffic Alert, Distance Indication, Driver Alert, Forward Collision Warning, Lane Keeping Alert and Traffic Sign Recognition. Ford offers 11 models with a 5-star safety rating from Euro NCAP: B-MAX, Edge, Fiesta, Focus, Galaxy, Kuga, Mondeo, Ranger, S-MAX, Tourneo Courier, and Transit and Tourneo Custom. The Fiesta Active crossover – the first in a new line-up of Active vehicles to be rolled out across the Ford range in years to come – and the all-new 200 PS Fiesta ST will also go on sale next year.